Mugabe’s office did not respond to requests for comment. A spokesman for the British embassy in Zimbabwe’s capital, Harare, said the UK was not involved in any plan for a coalition to succeed Mugabe. “The UK does not back any party, candidate, faction or coalition in Zimbabwe. It is up to Zimbabweans to choose who they want to govern them through a free and fair election.” The embassy said rumours and leaked intelligence documents were promoting disinformation. Christopher Mutsvangwa, head of the war veterans association, referring to the possibility of a deal between Vice President Emmerson Mnangagwa and Morgan Tsvangirai, the Zimbabwe opposition leader. Reuters has not been able to determine the intended recipients of the documents or their exact origin within the CIO. The intelligence agency officially reports to Mugabe but has splintered as opposition to his rule, which has lasted 37 years, has grown, according to two Zimbabwean intelligence agents interviewed by Reuters. The CIO did not respond to requests for comment sent to it through Mugabe’s office. The intelligence reports say that some of Mugabe’s army generals are starting to swallow their disdain for Tsvangirai, who, as a former union leader rather than liberation veteran, has never commanded the respect of the military. The majority of senior military officers “are saying that it is better to clandestinely rally behind Tsvangirai for a change, and have secretly rubbed shoulders with Tsvangirai and cannot see anything wrong with him,” a report dated June 2 this year says. An army spokesman did not respond to written and telephone requests for comment. In his early years, Mugabe, a former Marxist guerrilla, won plaudits for improving healthcare and education, promoting economic growth and reconciling with Zimbabwe’s white minority, including farmers. But in 1998 Tsvangirai’s Movement for Democratic Change emerged as a serious threat to ZANU-PF, and Mugabe changed tack. The tipping point came in 2000 when Mugabe approved radical land reforms that encouraged veterans from the fight for liberation to occupy some 4,000 white-owned commercial farms. At least 12 farmers were murdered. Most fled with their title deeds to countries such as South Africa, Britain or Australia. A few remained in Zimbabwe, where they became active in opposition politics. After Mugabe loyalists and inexperienced black farmers took over the land, the economy went into freefall. Before 2000, farming accounted for 40 percent of all exports; a decade later the figure was just 3 percent. GDP almost halved from 1998 to 2008. The central bank began printing money to compensate and hyperinflation took hold. At its height Zimbabweans were buying loaves of bread with Z$100 trillion notes. Mugabe was forced to cede some control in 2009 to a unity government that scrapped the worthless Zimbabwe dollar in favour of the U.S. dollar. Economic growth resumed. But since Mugabe regained outright control in a 2013 election, growth has faded and the central bank has begun issuing “bond notes,” a domestic quasi-currency that is already depreciating. It was against this dismal economic backdrop that potential successors to Mugabe began planning for his departure. According to the intelligence files, Mnangagwa’s overtures to Tsvangirai and white farmers became apparent in early 2015 amid bitter strife within the ZANU-PF party. On one side is Mnangagwa’s faction – dubbed “Team Lacoste” after the crocodile-branded French fashion chain. On the other is G40, a group of young ZANU-PF members who have coalesced around Mugabe’s 52-year-old wife, Grace. 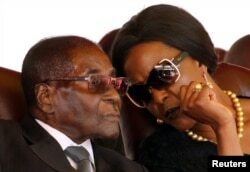 Grace Mugabe and her husband, Robert Mugabe. In March 2015, the intelligence documents make the first mention of Mnangagwa meeting white farmers, including Charles Taffs, a former president of the Commercial Farmers Union (CFU), the farmers’ professional association. Some of the gatherings were boozy affairs, according to the intelligence reports. “Mnangagwa had a slip of the tongue this week that angered Mugabe and Grace, when he told people who were around that ZANU-PF rigged the elections in 2013, this being said while under the influence of liquor,” a March 19, 2015 report reads. The problem for Mnangagwa is that, if he ran for president, it is unlikely he could win an election in his own right, according to political analysts. He holds impeccable credentials from the struggle for liberation, having fought alongside Mugabe against the loathed white-minority government of what was then Rhodesia. 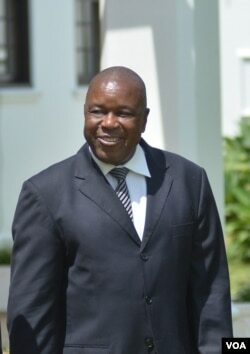 However, his reputation suffered in the early 1980s, when Zimbabwe’s army brutally suppressed dissent, mainly in the western province of Matabeleland North. In the so-called Gukurahundi crackdown, the army’s North Korean-trained Fifth Brigade killed an estimated 20,000 people, most of them from the minority Ndebele tribe. Mnangagwa was state security minister at the time. He has denied any involvement in the massacres, and did not offer fresh comment; but in the eyes of many voters he is still too tarnished to be electable. Mnangagwa failed to win a seat in parliamentary elections in 2000 and 2005, but was appointed by Mugabe to unelected seats and became parliamentary speaker in 2000. He has served as vice-president since 2014. Tsvangirai beat Mugabe in the first round of an election in 2008 only to pull out of the second round because of violence. Mnangagwa, according to people in his camp and Western diplomats, sees in Tsvangirai a politician who can deliver broad public support to complement his own connections with powerful political and military interests. Mnangagwa and the Ministry of Media did not respond to requests for comment. Mnangagwa’s supporter Christopher Mutsvangwa heads the Liberation War Veterans Association, whose members include veterans who expelled the white farmers nearly two decades ago. He told Reuters that Tsvangirai could have a role in government if Mnangagwa became president. According to the intelligence reports, Mutsvangwa is a middleman between various parties involved in a possible coalition government. “Mutsvangwa is more than prepared to make sure that Mnangagwa and Tsvangirai strike up a coalition. He says that the country needs no election at this stage, just a change of leadership and structure of government,” a Feb. 22 intelligence report says. He said it was his duty to work with all political sides, and that he had “reached out” to Tsvangirai and the “post-colonial white diaspora.” He added that as chairman of the war veterans he wanted to ensure a “peer comrade” takes over from Mugabe and that Mnangagwa could naturally aspire to the highest office. In a statement in 2016 the war veterans, many of whom are now nearing retirement, accused Mugabe of being “ideologically bankrupt” and ignoring the plight of Zimbabwe’s masses as the economy imploded. Mutsvangwa said his only aim is rebuilding the economy and country. For Tsvangirai, a deal with Mnangagwa may be the best shot at the power he has craved for decades. Speaking to Reuters in June, Tsvangirai did not rule out a coalition deal. “For the moment, it’s an electoral contestation but post-that, who knows? What are the two things that are important – stability and legitimacy. 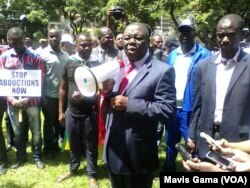 That is the only way in which you can move the country forward,” Tsvangirai said. 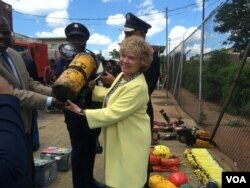 Amid all the jockeying for position, one influential figure is Catriona Laing, the British ambassador to Zimbabwe. According to four people with direct knowledge of coalition-related discussions about post-Mugabe rebuilding, Laing favours Mnangagwa to succeed Mugabe. In addition, three Harare-based Western diplomats said Laing, a development expert rather than career diplomat, supports the idea of a coalition government, believing such a move is needed to maintain Zimbabwe’s stability. The documents give no verifiable evidence for that claim and Reuters could not confirm it. Whether any plan for a coalition comes to fruition remains to be seen. Even with the support of some army generals, Mnangagwa will face significant opposition from the president’s wife, Grace, and the G40 group supporting her in the struggle to assume the seat Mugabe has occupied for nearly four decades. “I will have an ailment here and there, but bodywise, all my internal organs … very firm, very strong,” he said, as he learnt against a lectern. Grace Mugabe’s G40 faction suffered a setback this month when she was accused of assaulting a 20-year-old South African model with an electric cable in a luxury Johannesburg hotel. Grace Mugabe made no public comment on the incident, but her supporters said the allegations were unsubstantiated. Pretoria granted Grace Mugabe diplomatic immunity, allowing her to avoid prosecution; the Democratic Alliance, South Africa’s main opposition party, is challenging that immunity in court. Some diplomats in Harare say the United States and European Union are opposed to the idea of Britain backing Mnangagwa because they are concerned about being ostracized by ZANU-PF and its G40 faction should events unravel and go against Mnangagwa. FILE - A farmer addresses a meeting of white commercial farmers in Harare, Zimbabwe, Feb. 5, 2010. Some of the thousands of white Zimbabwean farmers evicted from their land in the early 2000s by President Robert Mugabe’s supporters continue to hold out hopes of one day receiving compensation and returning to the country. “I know friends who have gone to Zambia, Britain, South Africa and Australia. They’d love to come back to Zimbabwe,” Peter Steyl, President of Zimbabwe’s Commercial Farmers Union (CFU), told Reuters in an interview in Harare. The CFU represents white and black farmers. Senior figures in Zimbabwe's ruling ZANU-PF party have acknowledged publicly that white farmers should be compensated for their losses two decades ago, although talks with farmers have yet to produce any major breakthrough. Finance Minister Patrick Chinamasa told parliament in July that Harare had paid $134 million in compensation last year; farmers disputed this. Land ownership has been a central issue for decades in Zimbabwe as it struggles to deal with racial discrimination dating back to British colonial rule in what was then Rhodesia. At independence, white farmers owned more than 70 percent of the most fertile land and generated 80 percent of the country’s agricultural output, according to academics. Reforms began after independence with a “willing buyer, willing seller” system aimed at redistributing land to poor black subsistence farmers. In the 1990s, compulsory acquisition of land began with some funding provided by Britain. But for many poor Zimbabweans change was too slow. Mugabe then approved radical land reforms that encouraged veterans from the fight for liberation to occupy some 4,000 white-owned commercial farms. The move secured him loyalty among the army and ruling party. Most of the land went to Mugabe supporters, but many did not know how to farm. The agricultural economy and exports suffered. Mugabe has rejected the possibility of mending rifts with white farmers, but his health is ailing and the mood within the ruling party is changing, according to farming and political sources. One of the key obstacles to any deal is the issue of compensation. White farmers have largely agreed they shouldn’t be paid for land that became white-owned under British rule; but they do want to be compensated for the improvements they made and for farming machinery that was either stolen or destroyed during the early 2000s. The cost of such compensation may be so high that Zimbabwe would need the help of the International Monetary Fund (IMF) to foot the bill. Several farming sources said compensation for fixed assets and loss of income and stock - but not the land - could be as much as $10 billion. International creditors, including Western governments and the IMF, have made clear that farmers’ compensation needs to be agreed before wider discussions about rescheduling Zimbabwe’s existing $7 billion mountain of defaulted international debt, diplomats said.